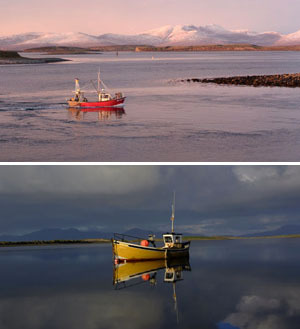 The Clew Bay area is part of the North Western Fisheries Region which is, undoubtedly, one of Europe’s top angling destinations and is considered by many as a salmon fishing paradise. The area also offers top class sea angling and also has some coarse fishing. The north western region is dominated the mighty River Moy which produces about 8,000 salmon to the rod annually. As well as the Moy, the region has several other important fisheries which enjoy good runs salmon and sea trout. The region attracts salmon anglers from more than thirty countries worldwide each year. Its importance as a producer of salmon is underlined by the fact that more than 30% of Irelandâ€™s total salmon catch is taken in the region. Salmon fisheries range from the beautiful Glencar Lough/Drumcliffe River system in Co. Sligo to the Burrishoole Fishery (Loughs Feagh and Furnace) near Newport in Co. Mayo provide high quality lake salmon angling. Stocks here are augmented by a salmon ranching programme run by Ireland’s Marine Institute. The Newport River and Lough Beltra are also well known salmon fisheries and also hold sea trout but the killing of this species is prohibited on these fisheries and on the Burrishoole Fishery as a conservation measure. Two of the great western lakes, Lough Conn and Lough Arrow, are also located in this region and both have long established reputations as producers of quality wild brown trout. In addition to these major fisheries, the region has numerous smaller lakes and rivers which offer a wide variety of fishing for trout. Some of these are stocked lakes but several hold stocks of small, wild trout. A number of small rivers e.g. some of the Moy tributaries, provide fishing for brown trout. On the south of the Clew Bay area and towards Killery Harbour there are rivers such as the Carrownisky, Erriff and mountain lakes such as Doo Lough which are internationally renowned for fly-fishing salmon and trout. The Owenmore and Owenduff Rivers provide excellent salmon and sea trout fishing. They are controlled mainly by private ownership with permits available on some of the reaches. For more information on fishing in the West of Ireland go to www.fishinginireland.info. 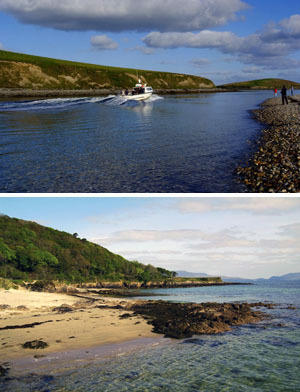 Clew Bay’s island-studded bay, bounded to north and south by magnificent mountains and guarded by the great bastions of Clare Island and Achill, is another of Ireland’s finest sea angling regions. Clew Bay was the most famous Skate fishery in the UK and Ireland and there is still remarkable fishing available in this unique ecosystem. Thankfully the Skate population has stabilised and may even be recovering albeit very slowly. There are over forty species available in Clew Bay and twenty in a day off a boat is definitely possible. Clew Bay is definitely a significant nursery area and local and visiting anglers should practice catch and release in order to ensure the future of the fish stocks. Clare Island Ask any of the local skippers where the best sea angling in Clew Bay is and one place that always comes to the fore is the deep waters under the cliffs of Clare Island.The current Irish record Blue Shark and Porbeagle Shark records were both taken in the ocean off Achill Island. Clew Bay’s fame as a common skate ground is slowly recovering given the introduction of mandatory catch & release (bar a new record). The deep waters around Clare Island offer superb fishing incl. octopus and John Dory. Good pollack are always available on the drift from the reefs around Deace’s Rock and further out the Bills Rock. The Newport Sea Angling Festival takes place over the last weekend in July, with shore angling on the Friday and boat-angling on Saturday and Sunday. The Eddie Gibbons Memorial Competition for boat angling is on the first Sunday in September. s offer superb reef fishing. Bertra Strand Like Old Head, this harbours two distinct and different fishing locations. The beach itself offers Flatfish and supposedly Bass around the rocky spine in the middle. Spinning with bass bullets around the rocks on the left hand side might work. There is never a large surf on this beach, even in winter! At the far end of the beach, a good walk, you find a very deep channel nestled under a ridge of loose stones. A very swift current races through this channel either side of high and low tide. Species & Techniques: A slack water pool to the east of the channel reputedly holds Monkfish and even Skate! The channel itself will give you Mackerel in season and large Flatfish at slack water at its western end. The currents are dangerous and strong in this channel therefore one should never enter the water here fishing. Old Head – There are effectively two locations here, the very tidal pier which gives access to fishing over sand and some rock platforms located behind the wooded headland… accessible via the path and over several stiles. The pier gives access to sand and mixed ground but we have always drawn a blank on it, bar that Weeverfish. One imagines that Flatfish, Bass and Ray are possibilities there. Worm baits are best, although ragworm in scarce on the west coast. The rock platforms are known to give access to Conger and Bull Huss, Pollack, Wrasse, Coalfish, Mackerel and Garfish in season, on sandy stretches Flounder and Dab, and the occassional Ray in summer. Copyright © 2019 Bertra Strand Apartments, Westport All Rights Reserved.